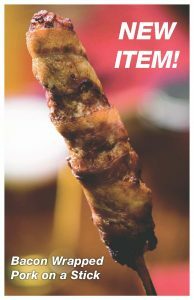 New Menu Item at State Fair: Bacon Wrapped Pork On-a-Stick! What is the Pork Schoppe? The Pork Schoppe is a food stand operated by Wisconsin Pork Association. The Pork Schoppe serves as the association’s primary fundraiser. Funds raised help support Wisconsin Pork Association’s mission to ensure the future success of the Wisconsin pork industry. To learn more about programs we support, visit our About Us page. 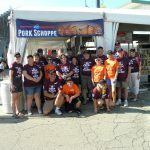 You can find the Pork Schoppe at two main events each year: The Wisconsin State Fair (August) and the WPS Farm Show (March). The Pork Schoppe is located on the Northeast corner of the Wisconsin Products Pavilion at the intersection of Grandstand and Third Street. Look for our big white tent between the Wisconsin Products Pavilion and the Coliseum. 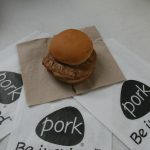 Look for the Pork Schoppe inside the WPS Farm Show food tent. You can’t miss us! In addition, many of our affiliated county pork producer organizations serve similar products at county fairs and other events. Contact us for more details. The Pork Schoppe is proud to serve quality pork products. 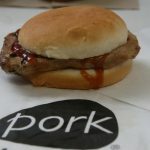 Our most popular items are our Butterfly Pork Chop Sandwich, Pork Chop on a Stick, and Pork Burger. 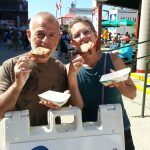 Click to view the 2018 Pork Schoppe Menu at the Wisconsin State Fair. *New Menu Item! 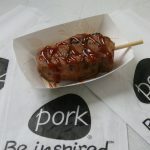 In 2018, Bacon-Wrapped Pork On-a-Stick will be offered at the WI State Fair. The tender, juicy pork loin wrapped in hardwood smoked bacon, then lightly seasoned and grilled, is sure to be your new favorite fair food on a stick! 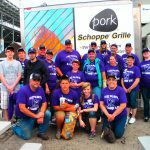 Wisconsin Pork Association relies on numerous volunteer groups who generously donate their time to help run the Pork Schoppe. If your group is interested in a volunteer opportunity, please contact us. Examples of groups who have volunteered in the past include FFA and 4-H clubs, sports teams, and collegiate organizations.